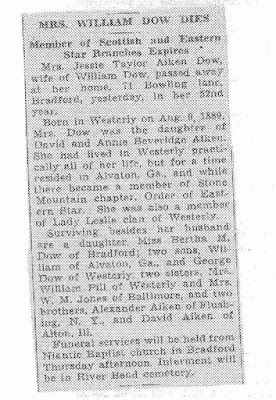 Jessie Taylor Aiken's Obituary, located by Rosalie for me. 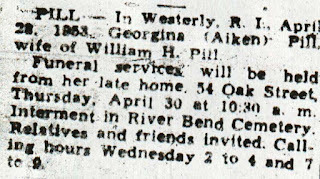 When my fellow researcher, Rosalie located this obituary, I knew that I had a lot more to learn about my grandmother's family if I wanted to learn more about my paternal great grandparents. Jessie was named for Jessie Taylor 1809-1879, wife of Alexander Aiken and Alexander Esson of Newhills, Aberdeen Scotland. 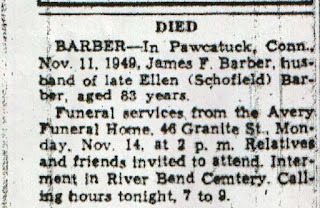 She died in Westerly, Rhode Island and is buried in River Bend Cemetery in the Dow plot. Growing up, I knew nothing about her except that somehow she was related to me through a woman that my dad called Freckles. 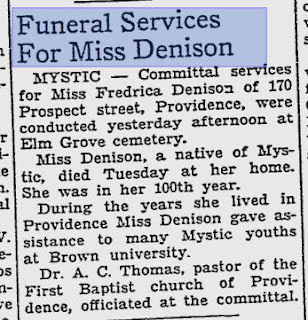 Freckles turned out to be Bertha M. Dow, Jessie's youngest daughter who died, unmarried, and is buried without a headstone in the Dow plot at River Bend Cemetery in Westerly. From Jessie's parent's death records, I can see that Jessie moved to Georgia to take care of her parents, who had retired there and then moved back to Westerly when they died. She lived at 71 Bowling Lane in Bradford. She was only 52 when she died. 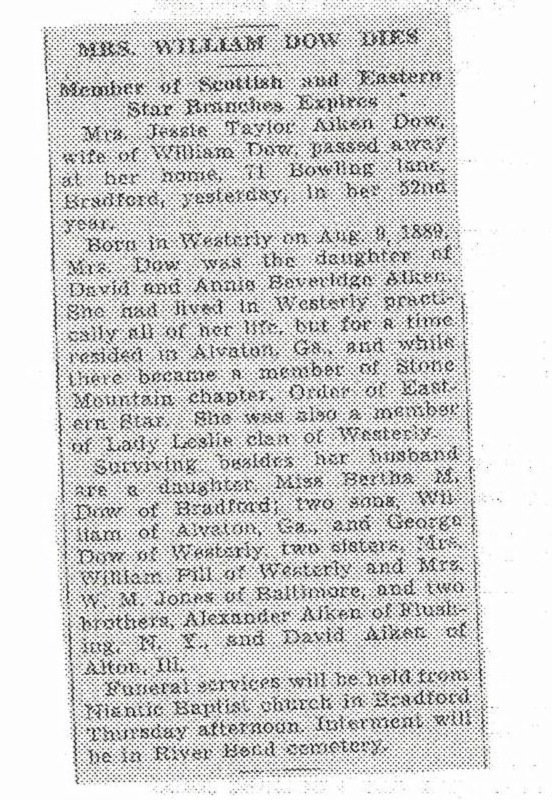 From this obituary, I can confirm some married names of females and add to my family tree the organizations that Jessie was a member of. Many people are concerned about the accuracy of the gravestones they photograph. We all hope that this last part of an ancestor's timeline is correct. Many times it is not. The stone may not be even "set" at graveside for many months or years. My parents and paternal grandparents are buried (with headstones) close to but not in the same plot as Georgina and her baby son. The baby son's headstone is definitively older that the gravestone placed after 1953 to mark her grave. Cemeteries are not necessarily responsible for the names and dates of those stones. They are paid for by estates and family members. With divorce, annulments and multiple marriages no proof is required when purchasing a stone. In this case, Georgina had children (and now later generations) with her first husband and no children with her second husband. Her family wanted to put Beattie on the stone because that's how she was known to that generation. My parents put up their own gravestone and my mother did not bother to put her maiden name on it. However, newspapers and funeral homes should offer the correct information. We have to hope that it is correct. I can tell you that Georgina's obituary and her death notice are correct. I have ancestors who were buried with first husbands because that is how their children wished them to be remembered. Is this a prickly situation for many researchers? Yes. This lovely little girl with the lace on her dress is Georgina Watt Moir Aiken, sister to my paternal grandmother, fifth child of my great grandparents, David Aiken and Annie Beveridge. This is her death notice from the Westerly Sun, Westerly, Rhode Island located by fellow researcher, Rosalie. 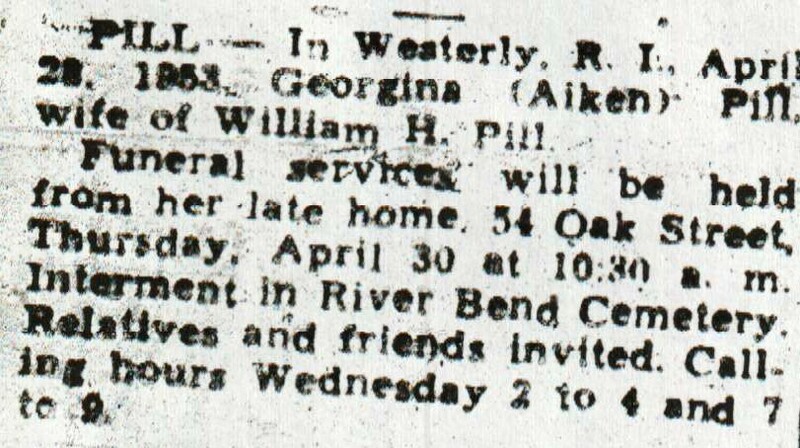 We know from this newspaper that Georgina died before her husband William H. Pill and that she lived at 54 Oak Street in 1953 and that she is buried in River Bend Cemetery in Westerly. 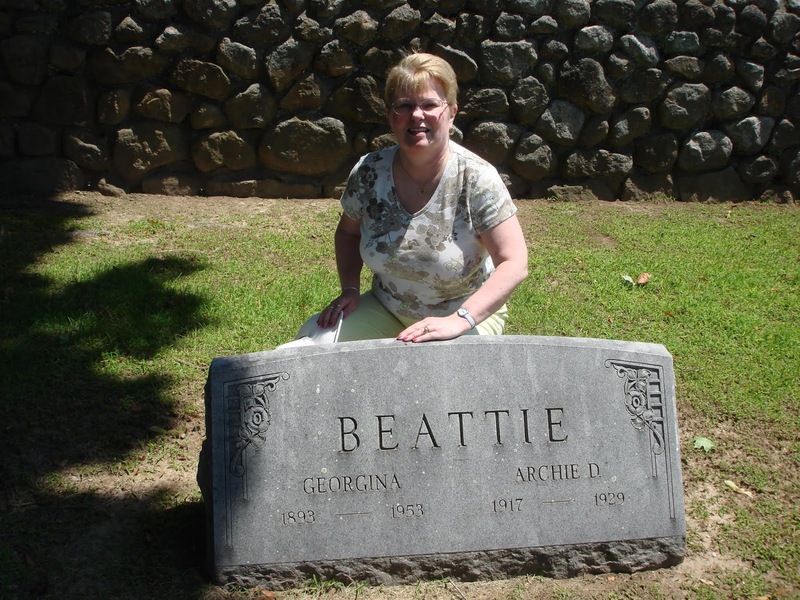 This gravestone was erected by a family member of her first husband, Archibald Beattie. They were divorced. 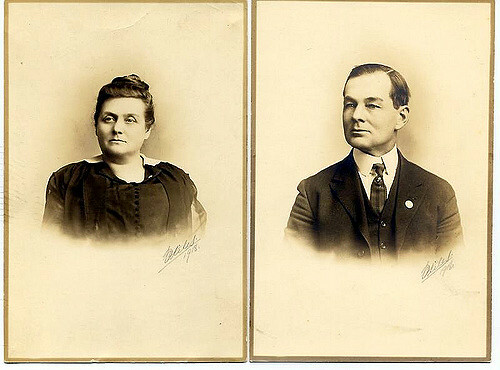 Archibald and Georgina had six children together. Her second husband isn't named on her stone, is he? Rosalie told me why and it makes sense. Good thing I knew something about this when I went looking for it. It's a prickly situation when a woman's gravestone doesn't match her history. Even her year of birth is incorrect (it says 1893) but at least her baby son's name is correct and it is a pretty stone located near her two sisters. 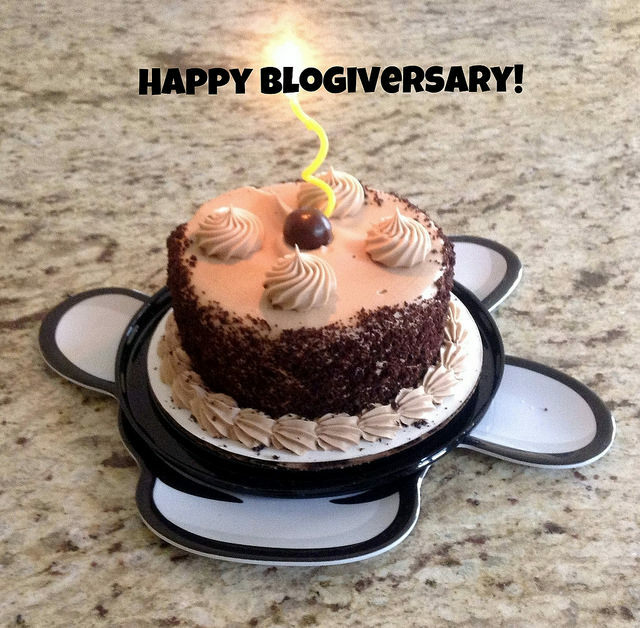 Tomorrow marks the day that I started writing this blog. 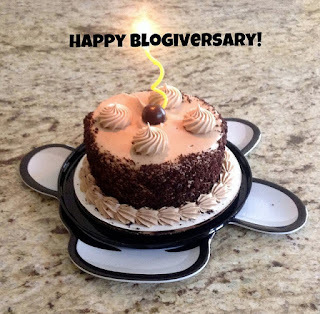 June 6, 2006 was a date easy to remember, I thought, but I didn't know that I would be blogging this long. I have a blog post ready for tomorrow. 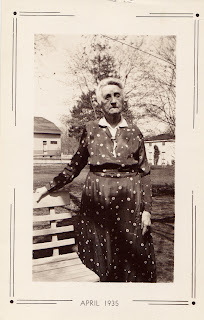 It is getting harder to keep up and work on the family history book I have begun to write. There are no known photographs of Josiah F. Broadfoot and no one in my family has the distinguished service cross. Josiah Ferguson Broadfoot died for his country, in France, during World War I. 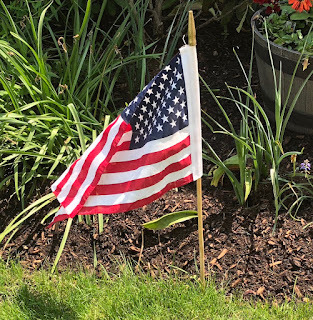 At the time of his service, he was the oldest son of Thomas Broadfoot (deceased) and his wife Annie Ferguson and lived his whole youth in Westerly, RI. He was 29 years old and single. I get more questions about Josiah than any other person in my family that died in service to his county. 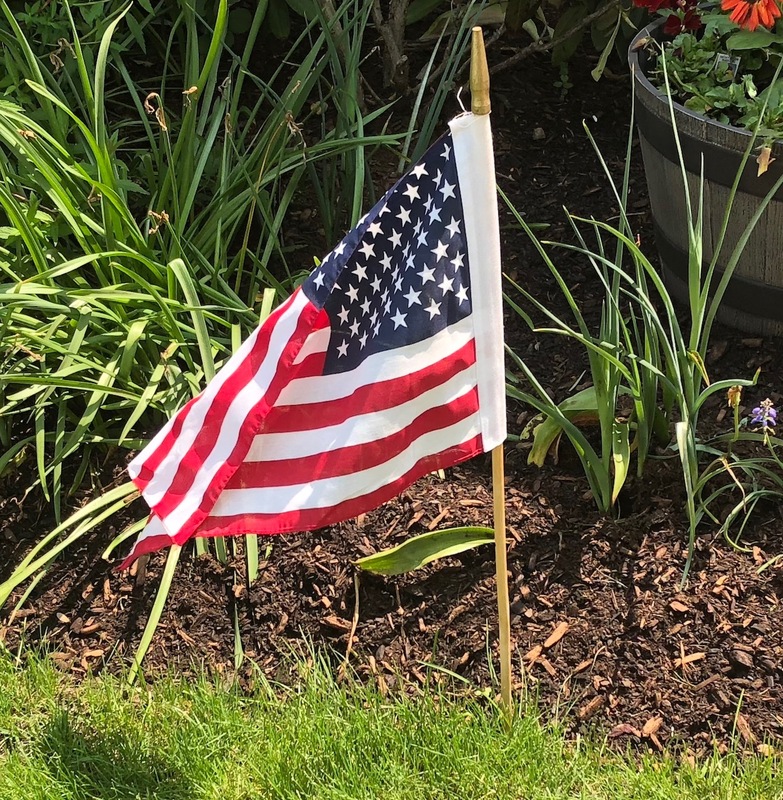 During that service time, Josiah's brothers, John and Walter were also serving, John with the Canadian forces and Walter was in the US Navy. I have located a Norwich, CT newspaper article that tell me more than any military record I have found so far. He is buried in France and has a memorial cross at River Bend Cemetery in his family plot in Westerly, RI. His father, called "Uncle Tom", by my branch of the family died in 1911, so Uncle Tom's wife must have had someone carve the white granite cross in the family plot. The Westerly Disabled Veteran's Chapter #6 is dedicated in Josiah's memory. Called Joe by family and friends, he died of his wounds in a hospital overseas. A bullet penetrated the tank he was driving and lodged in his abdomen. He died in a hospital of this wound. He did not die on the battlefield. Miss Fredrica Denison was a descendant of Roger Williams through her mother, Amey Randall Manton Denison. For some time, I thought the Roger Williams line was through her father, Rev. Frederic Denison, because I didn't know how to read her baptismal record at NEHGS. It pays to revisit past searches because there is a much better explanation of what this "text only" database represents. It is a church member database. Adult baptism is a practice of American Baptists and occurs only when the person professes to believe in Jesus Christ without prompting by an adult. This is what the record looks like today and below that on the page is what the "original text" means. The B stands for baptism, and the rest is listing of her lineage. This database did confirm what my grandmother told me about her since she was alive in my lifetime. Fredrica is often spelled with an extra e (Frederica) and of course, the father's name could be spelled with a k.
Original Text Fredrica Denison Feb. 24, 1878, B Descend, of Roger Wil-liams and of Samuel Winsor. D. of Rev. Fred-eric. G. g. d. of Stephen Randall. G. dau. of Shadrach Manton. Providence, RI: Catalog of the Members of the First Baptist Church. (Online database. AmericanAncestors.org, New England Historic Genealogical Society, 2003.) Originally Published as: Historical Catalogue of the Members of the First Baptist Church in Providence, Rhode Island by Henry Melville King. Providence: F. H. Townsend, 1908. Born in Cork, Ireland to English Parents, Ann nursed Capt. George Denison when he was wounded in the Cromwell War. His first wife, Bridget Thompson died and left him a widower with two little girls. Ann and George married in Ireland and when they left for America, Ann was heavily pregnant with their first child, John who was born in Roxbury, Massachusetts on 14 July 1646. It is said that this was ten days after they arrived in America. It is a recorded birth. There were six more children born to Ann and George. Ann was my 8th great grandmother and her petite and perfectly readable gravestone is a stone's throw from the graves of my maternal grandparents. No one ever showed me this stone and it wasn't until I began to do gravestone work that I appreciated how special this original stone is and how beloved Ann was over the many years since she died. 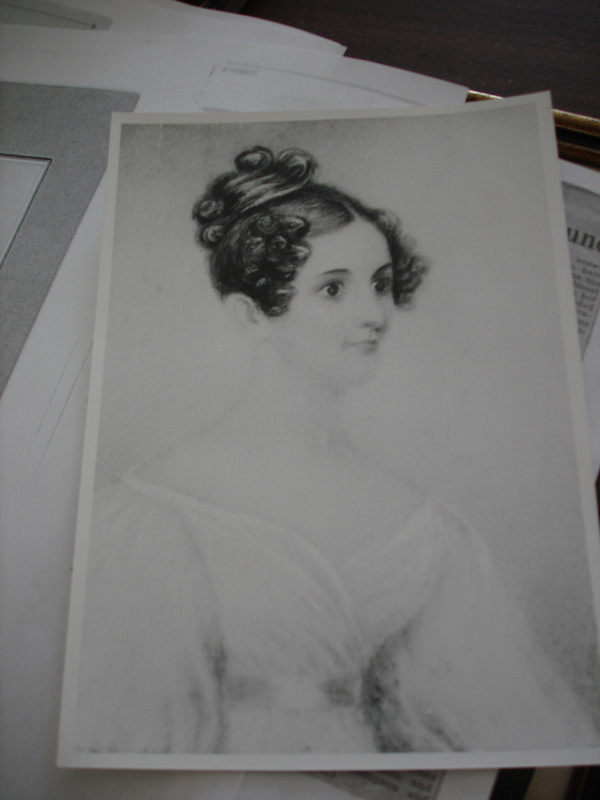 Of course, she doesn't have an obituary but The Dension Society gave me an article about the miniature hand drawn portrait written by historian and descendant Grace Denison Wheeler. (The portrait is now in a safe place and no, I did not see it.) But, it has been dated to a later period than previously thought and so is not evidence of her actual face. 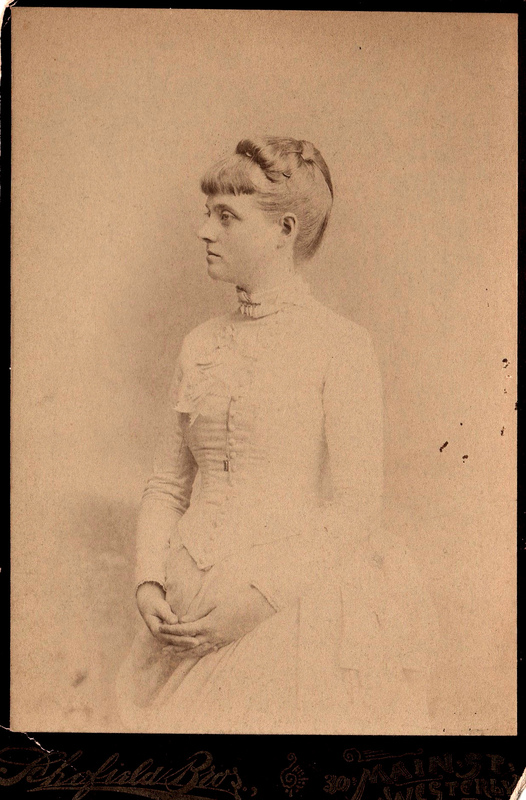 widow of Joseph A. Schofield, Jr. 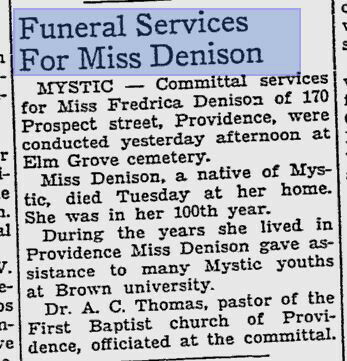 The Westerly, Rhode Island City directory of 1945 lists the exact death date of my 99 year old second great grandmother, who lived most of her life in Rhode Island. She is buried with her husband in River Bend Cemetery in Westerly, RI. Her daughter Nellie/Ellen's birth record lists Sarah's birth location as East Greenwich, RI where every other source lists this fact as North Kingstown, RI. East Greenwich, RI and North Kingstown, RI share a border. In 1850, she is listed as living with her parents and siblings in East Greenwich, RI. As a family of Baptists, her baptism at the age of 11 in the First Baptist Church of Westerly, RI, places them living there. Her older brother, George C. was baptized in 1851 so it places this family living in Westerly, having moved from East Greenwich before 1850. Sarah's father was a twiller in the 1850 census and I remember a spinning wheel in my great aunt's home when I was a little girl. Joseph and Sarah lived in the house on Elm Street, in Westerly until about 1925 as Sarah is not listed in the Rhode Island State census of 1925. The whole family moved to 160 West Broad St. in nearby Pawcatuck, CT probably in that year. My mother told me that Sarah was sharp minded in her nineties and was making pies on Memorial Day weekend and said she felt unwell so they put her to bed. She died on Monday, 29 May 1944 having never arisen from her bed. I can tell you that I will not be making pies the day before I die. Was her name Nellie or Ellen Schofield Barber? For many years, all I had for my grandmother's mother was a date of birth and death on the Barber family gravestone, which read 1868 to 1944. I have no idea who placed the gravestone at River Bend Cemetery but it was before my lifetime. 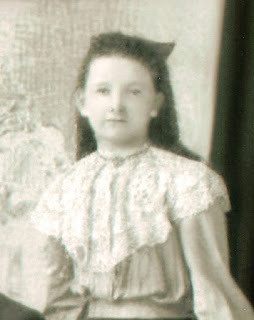 This week with the help of my wonderful researcher/detective cousin, Barbara Fallon, I have the birth record of Nellie. It was not filed until 18 February of 1868 but a white, single female child born on 8 Dec 1867 to Joseph and Sarah Schofield in Westerly, Rhode Island is surely her. The heading on the vital record book (Book 2) says, "First Name, if any"so I think the record keepers may not have been concerned about first names in this place and time. All records found to date tell me her name was Nellie with a middle initial of E. She preferred to be called Ellen and that might be her middle name. Nellie/Ellen was an only child and sometime in her childhood before she married J. Fred Barber, at the age of 22, she had rheumatic fever (Streptcoccus pyrogenes) and suffered with the pain and side effects of that, all her life. My grandmother who told me this said that she tended to be obese after she bore three children. Because of my grandmother's birth weight of 13 pounds, I think Nellie/Ellen may also have been diabetic. My grandmother was the middle child and Nellie's last child, my great aunt, Tattie was small and had poor hearing and eyesight. I have several photographs of her taken when she was young and her face is so much like her father with the dark circles under the eyes (she probably had allergies). In 1935 at her mother's 90th birthday party, Nellie looks uncomfortable in an outdoor setting on Elm St. in Westerly, Rhode Island. When Nellie's father, Joseph died in 1917, the property became joined jointly by his wife Sarah and Nellie and the family decided to move there. When the house became too small for everyone to live together, they moved to Pawcatuck, CT. It is most likely that she died at home there on 16 Jun 1944. My grandmother called this period of time, the terrible year, because so many family members died. The furthermost ancestor in my Scholfield/Schofield line was Arthur, spectacle maker of Saddleworth, England. He was my 6th great grandfather. Oldest son of James Albert Barber, Civil War Medal of Honor recipient and one of seven sons, James, was my maternal great grandfather. When I saw his photograph in my mother's wedding album, I asked my mother to tell me about him. As she talked, I began to remember him. Both my parents were there and I only remember him a tiny bit as I was one year, eleven months and seven days old when he died. My research tells me that he loved cars and hated fishing and repaired marine equipment as well as automotive repair. 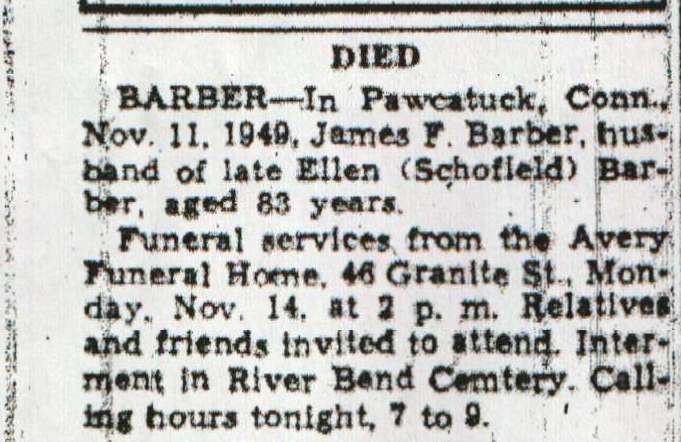 He was once in business with his father-in-law, Joseph Schofield, who repaired bicycles and lived his last years, as a widower, living in Pawcatuck, CT with my great-aunt Tattie (Dorothy Palmer Barber Bliven). I am grateful to own a photo of him in his middle years (1918) and to find his marriage record to my great grandmother, Ellen.